REMOURBAN is a large scale demonstration project, whose purpose is to accelerate the urban transformation towards the smart city concept taking into account all aspects of sustainability. Several objectives will be achieved, being the most relevant the development of a holistic and replicable model for sustainable urban regeneration, with a jointly approach in the sectors of energy, mobility and ICTs. Creation of a holistic catalogue of innovative technologies and solutions, focused on energy (building and district refurbishment interventions), mobility (sustainable transportation strategies) and ICTs (smart grids and city information platforms), whose potential and cost-effectiveness will favour the replicability. Identification and overcome of non-technical barriers, by addressing strategies for optimizing the regulatory frameworks, enhancing the innovative public procurement procedures and promoting the concept of smart city and its social acceptance. Development of new integrated business models, oriented at the creation of a European market for innovation, by offering technology solutions to economies of scale and by generating strategies for a smart combination of investments and reduction of risks. Definition of a complete evaluation procedure using both sustainability and smartness indicators, in order to assess, in an integrated way, the impact of the foreseen interventions and the most significant aspects from the sustainability point of view. The deployment and validation of the sustainable urban regeneration model will be carried out through three large scale demonstrations in the three lighthouse cities, which are committed to deploy very ambitious holistic interventions, well balanced in terms of actions on energy, mobility and ICTs, that will be fully monitored and properly assessed. The first demonstration will be carried out in Valladolid (309.000 inhabitants), a medium-size city located in Spain. The demonstration aims at the reduction of 50% of the energy consumed and 80% of the CO2 emissions, and involves actively more than 5.700 citizens. The demonstration will consist on the renovation of 400 dwellings (total 24.600 m2), the implementation of renewable energy in the district heating system, the deployment of 50 electrical vehicles and improvement of the charging infrastructure, as well as the development of a city information platform for energy demand management. The second intervention will take place at Nottingham (306.000 inhabitants), located in central UK. The target of energy consumption reduction is estimated to be 50%, achieving 26% of reduction in terms of CO2 emissions. More than 8.100 citizens will be involved actively. The demonstration will consist on a deep renovation of 624 dwelling (total 26.823 m2), the deployment of 2 new electrical buses and fully use of the city electrical tram, deploying a city information platform for traffic management. 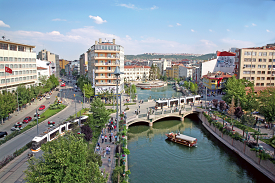 The third intervention will be located at Tepebasi (314.599 inhabitants), a municipality of the Eskisehir city, located in Turkey. The demonstration aims at the reduction of 85% in the energy consumption, and a 79% of the CO2 emissions. At least 600 citizens will be directly involved in the demonstration, in which 57 dwellings (9.110 m2) will be retrofitted, a district heating/cooling facility based on biomass will be installed, and 11 hybrid vehicles will be used, in addition to a 50 e-bike rental system. A ICT city management platform will be developed in order to put together all energy and mobility data.